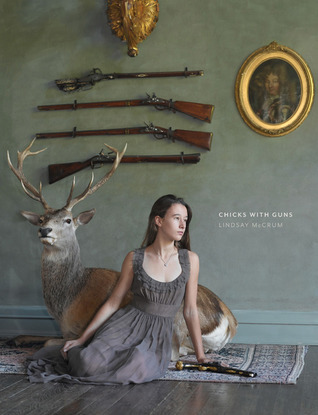 In Chicks with Guns, Lindsay McCrum has created a cultural portrait of women gun owners in America through photographs that are both beautiful and in a sense unexpected. The book examines issues of self-image and gender through the visual conventions of portraiture and fashion, but the guns are presented here not as superimposed props but as the very personal lifestyle accessories of the subjects portrayed. And it defies stereotypes often associated with aspects of the popular culture of both guns and women. Like the 15-20 million women gun owners in this country, the women we meet in Chicks with Guns (their portraits are accompanied by their own words), reside in all regions of the country, come from all levels of society, and participate seriously in diverse shooting activities. The women here are sportswomen, hunters, and competition shooters. Some use guns on their jobs and some for self-defense. They may not all be classically beautiful, but in these photographs they all look beautiful, exuding honesty, confidence, poise, power and pride. They are real women with real guns that play a part in their lives. By focusing her camera respectfully on this particular aspect of the American scene, gun-wielding women and girls, Lindsay McCrum sheds new light on who we are in America today. So thrilled that my library had a copy! The photos are gorgeous, the stories interesting and inspiring. Plus, I'm learning about firearms I hadn't heard of before. The only complaint is from my old eyes, wishing that the print used for the women's stories was just a little larger. I like the diversity of backgrounds featured, the variety of shooting activities and reasons for owning firearms, and the fact that not all the women are young. Many of the women come from hunting backgrounds, others are sport shooters, or just enjoy shooting targets, some are in law enforcement, and others merely want to protect their families. When I get better at shooting, maybe I will be in a future edition posing with my Walther PPQ or the Ruger 1211 10/22 rifle my husband got me for Christmas, but I'm not nearly as photogenic as the women who grace these pages.